Posted on December 16, 2013 by Financial Underdog	in budgeting, family. While I have nothing against big box stores, every time I walk into a supermarket (Superstore, Safeway, Save-On-Foods, etc.) I have to protect my money. If you are like me – you don’t have a money tree growing in your backyard – the amount of money you can spend on food every month is limited. At the same time, big grocery stores are after your wallet in a sense they want to sell you as much product as possible. Solution? You have to look out for yourself, and stick to your guns – and it means recognizing how supermarkets trick you into spending more money. All big stores use flashy discount price stickers to trick you into thinking you’re getting a good deal. Sometimes these stickers are red, sometimes yellow. But quite often the actual discount given is either non-existent or very minimal. But psychologically we pay more attention to discounted items and grab them just because they have “discount!” sticker attached to them. One of the good ways to compare one item to another is comparing it on “money per unit” basis. Since different products are packaged differently, “money per unit” measurement will tell you which product ultimately offers you a better deal. Real Canadian Superstore started posting these numbers on their price stickers and it really helps us when we shop. For example, if one package of peanut butter sells for $4.00 dollars ($1.50/100g.) and another brand is larger and sells for $7 ($0.95/100g. ), one quick look at “money per unit” number tells you the second product is a better deal. Of course, at that point the question is – do you really need this much peanut? In our case – definitely! 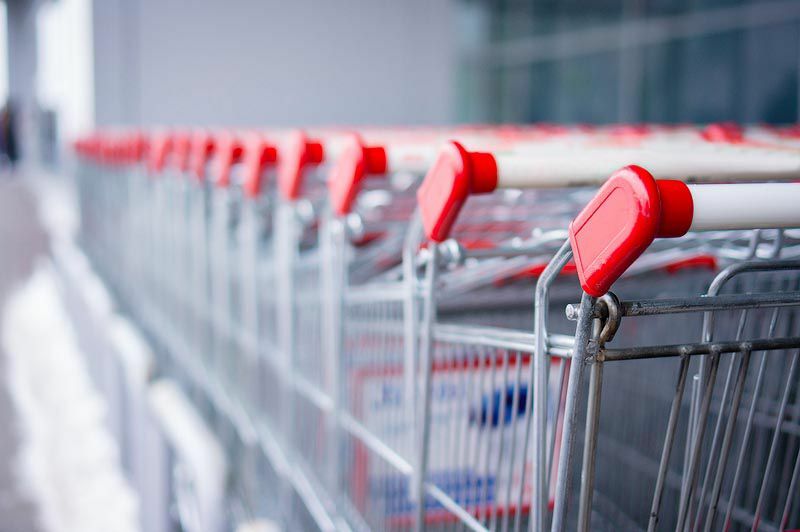 Shopping carts have been around for a while – first shopping cart was introduced in 1937 at Piggly Wiggly stores in Oklahoma. Now, here’s an interesting thing – shopping carts used to be much smaller. Store owners noticed that if you make shopping carts bigger, people will buy more items without even thinking about it. As a result people buy more items than they need. My advice to you? If you ever pop into grocery store for a small load, grab a basket. And always have a plan for your grocery run – make a list of what you need and stick to it at all costs. All big box grocery stores do that – Real Canadian Superstore, Walmart, Safeway, and Save-On. Have you ever wondered why veggies and fruit are always at the door? 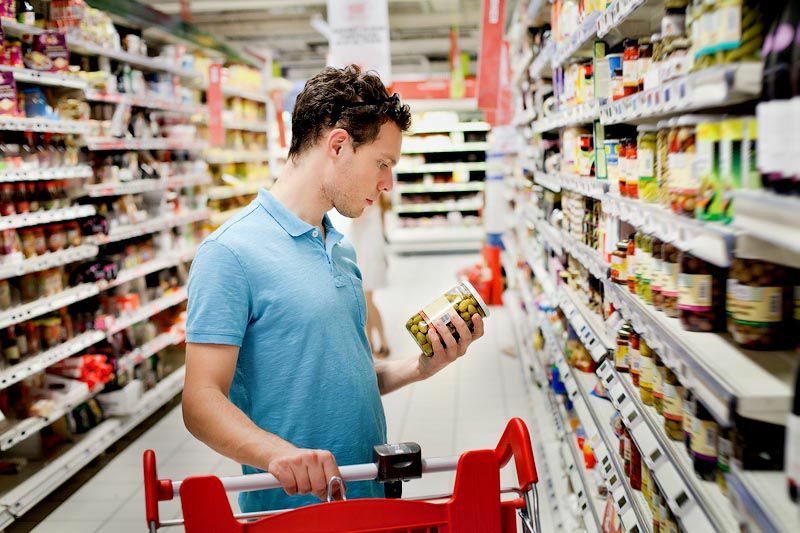 Shoppers’ behavior has been tested throughout the years. What researchers found is that if grocery store shoppers buy something relatively good and healthy right away, they’ll be more relaxed after it and more likely to buy something outside of the norm – say, potato chips or pastry. As a side note, all supermarkets spray their veggies with water to make them appear fresh because most people equate “fresh” with water and shiny appearance. So, the veggies in front of you may appear fresh, while in fact they’ve been sitting there for quite some time. 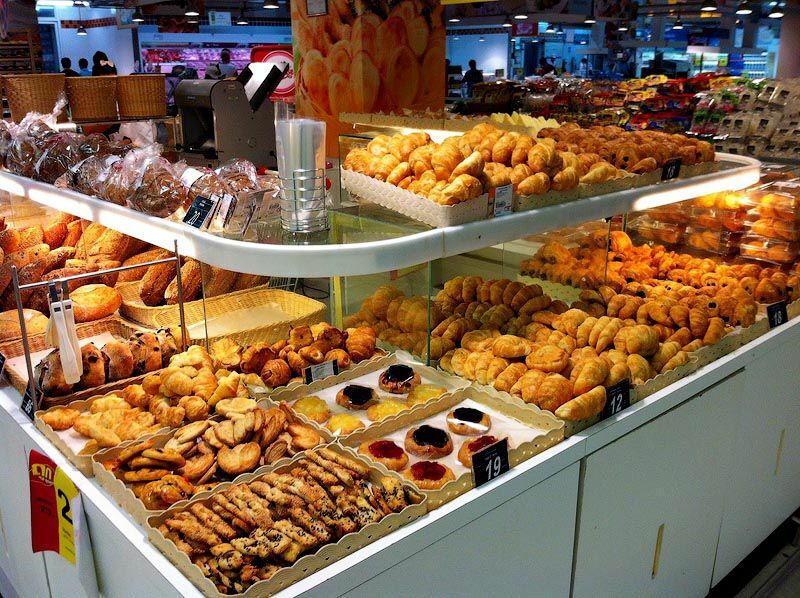 Ever noticed how grocery stores always have a pastry stand right next to the entrance? They are there for a reason – to make you hungry. Hungry people buy more food – and grocery stores want to make you hungry while you’re inside so you’d buy more items. Nothing like freshly baked muffins or croissants in front of you to get your stomach going. All of a sudden, you’re buying giant frozen lasagna to take home and eat right away – that’s how supermarkets trick you without you even noticing. My grandma always told me – never go to the store on empty stomach. Boy, was she right. There’s nothing random about how supermarkets are laid out. In most cases, you’ll find essential items (bread, milk, meat, veggies, etc.) in opposite locations. This is a tricky way to make you walk more – and in turn walk past all the other products. If all essential products were in one location, you’d out of the door in 10 minutes. But with a tricky layout most grocery stores employ, you end up picking up items you didn’t have in mind and slowly filling up your shopping cart. On top of it, some of the stores use small tiles in some areas. Why? To make your shopping cart rattle loudly which in turn makes you slow down and spend more time inside the aisles. In turn, you pay more attention to the items in front of you and perhaps pick up one or two. Have you ever noticed how meat and fish is often sold in areas that are painted white? This also has a reason, and in this case to make these items appear fresher. At the same time, other parts of the store can be painted in warm colors – apparently studies found these colors relax people and put them in a better mood. Have you ever noticed how more expensive brands are always located at the level of your eyes? Since more expensive products have better margins (translation – more profit for grocery stores), they tend to place them just where you’ll see them right away – at your eyes level. These are the products people tend to grab first – if they don’t take their time and look around. Some of the best deals I found at Real Canadian Superstore were always located almost at foot level – where people rarely look. More expensive brands actually pay for prominent location inside the store – because they know a lot of us grab the first thing we see without looking at other items. There’s a reason why most stores play music – and not just grocery stores. Quiet music relaxes you while you’re inside, and your mood improves. All of a sudden you slow down, and let your guard down. You start walking around and humming music while checking out the products. This almost always results in increased shopping. This is actually widely used inside shopping malls. Almost all clothing stores play their own music picked specifically for the target audience of this specific store. If the store sells hip clothes and targets young shoppers, they’ll play recent hits. If the store is all about older and more sophisticated audience, they’ll play easy listening or some soft jazz music. So, you’re almost done. You’ve loaded up your cart, and you’re heading straight towards the exit. But first you stop at the cashier and wait for him or her to scan all your purchases. Take a look around – around yourself you’ll find inexpensive items (chewing gum, chocolate bars, drinks, magazines etc.). These are the items people like to reward themselves with for a long and painful process of shopping. When you’re spending $100 on groceries, a small chocolate bar doesn’t seem like a lot, and you grab it as a small reward for yourself. And that’s exactly why it’s there! If you don’t have unlimited amount of money (and who does these days? ), pay attention to your shopping habits. Mrs. Financial Underdog always writes down a list of items we need before we head out – and this list only drives our shopping as opposed to letting the supermarket drive our purchases. You have to be aware how supermarkets trick you into spending more. Once again, I have nothing against big stores and supermarkets. But unfortunately, we’re at the opposite sides in this war – they’re fighting to take as much money away from me as possible, and I’m defending my money – my little soldiers – from them. Did you know about these? Leave me a comment with some of your own thoughts! ← Looking for a witty Facebook status about money? Working from a list works well. My wife also takes the ad from the week and her coupons! She does an excellent job saving us money! PS: Great website, I love what you’ve done with your finances at such young age!